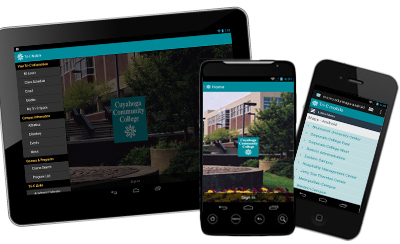 Tri-C Mobile lets you access a wide range of essential college life information and services like interactive campus maps, Blackboard courses, financial aid information, campus news, and the campus directory, all on the go, directly from your Smartphone. Best of all, it's FREE! Access My Tri-C Space right from your smartphone! Note: Android users must be connected to the FireFox Browser. Looking for someone? Search for faculty and staff with the Directory. Search campus buildings by name, pinpoint them on the map, and see their location relative to your own. Note: Android users now connect to Google Maps. Out of the loop? Get the latest Tri-C headlines with News. Get instant access to all of your Blackboard Learn™ course content on the go. Follow Tri-C on Facebook, Twitter, LinkedIn, YouTube, Pinterest, FourSquare, and Flickr. Browse and search courses for current and future terms, see course descriptions, times, locations, and availability. Get access to important numbers and information when you need them. Call to report an emergency or get information from the Tri-C Alert Emergency Information Hotline. Connect to important Tri-C resources including: Ask Tri-C, Athletics, Events, Financial Aid, Library, and Programs.